On Monday, a post on the Facebook account of Senior Gen. Min Aung Hlaing, the commander in chief in Myanmar, said that the military was carrying out an investigation into unidentified “people being killed and buried” in a cemetery in Inn Din. “Strong legal action will be taken if any member of security forces are involved,” the Facebook post said. During the wave of arson that has spread across the region since late August, many houses in Inn Din, an ethnically mixed community, were destroyed. But satellite evidence collected by Amnesty International showed that only Rohingya neighborhoods in Inn Din had been razed by fire. The relative of the detained Inn Din villager accused the government of wanting to hide the evidence shown in the documents. U Myint Kyaw, a member of the independent Myanmar Press Council, said he believed the arrests of the reporters and the Rakhine villagers were connected. The Reuters journalists U Wa Lone and U Kyaw Soe Oo, in a photograph released by Myanmar’s Ministry of Information after their arrest. Myanmar officials say that the office of the president, which is part of the country’s civilian leadership, has authorized the police to proceed with the case against the reporters. “Now it will be hard to stop the case against the journalists,” Mr. Myint Kyaw said. “The government should have done an investigation first,” into the existence of the mass grave, he added. A week after the reporters’ arrest, high-level members of Myanmar’s civilian government said they had no further information about why the two were arrested. Reuters declined to comment on the specifics of what its reporters were pursuing. 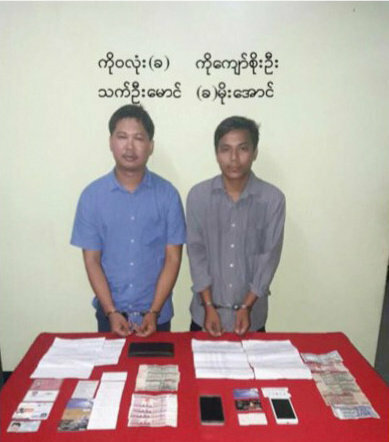 “Wa Lone and Kyaw Soe Oo are journalists who perform a crucial role in shedding light on news of global interest, and they are innocent of any wrongdoing,” Stephen J. Adler, president and editor in chief of Reuters, said in a statement. Mr. Wa Lone and Mr. Kyaw Soe Oo were charged under Myanmar’s Official Secrets Act. The colonial-era law stipulates up to 14 years in jail for offenders. Two police officers were also arrested when the journalists were detained. Both journalists had reported on the exodus of an estimated 650,000 Rohingya Muslims from northern Rakhine State to Bangladesh during the past three and a half months. While the Rohingya have been persecuted for decades by the Myanmar military, the latest campaign against the Muslim minority began after Rohingya insurgents attacked Myanmar security posts in late August. With the exception of carefully controlled government-led trips, local and foreign reporters have been barred from visiting northern Rakhine. Reuters has published witness accounts from the region provided by people that the news agency did not identify by name. Mr. Kyaw Soe Oo is from Rakhine, and Mr. Wa Lone reported from the region. Doctors Without Borders estimated last week that at least 6,700 Rohingya, including 730 children, had died in violence in Myanmar in the month after the crackdown began. Among the many unanswered questions is what happened to the bodies of those believed to have been killed by the military and by aligned ethnic Rakhine mobs. In September, reporters on an escorted government trip were shown bodies of dozens of Hindu villagers that the Myanmar military said had been killed by Rohingya insurgents. Burned villages in Rakhine State on Dec. 2. Hindu survivors, who fled to central Rakhine and to Bangladesh, have provided conflicting reports of who attacked their community. Some say that black-clad Rohingya militants orchestrated the assault, while others blamed the Tatmadaw, as the Myanmar military is known. No Rohingya corpses have been shown to the media. It is not clear what ethnic group the Inn Din mass grave might hold. In November, the Myanmar military released the results of an internal inquiry that cleared all soldiers in Rakhine of any misconduct. Not a single innocent civilian had been raped or killed by the security forces, the report said. 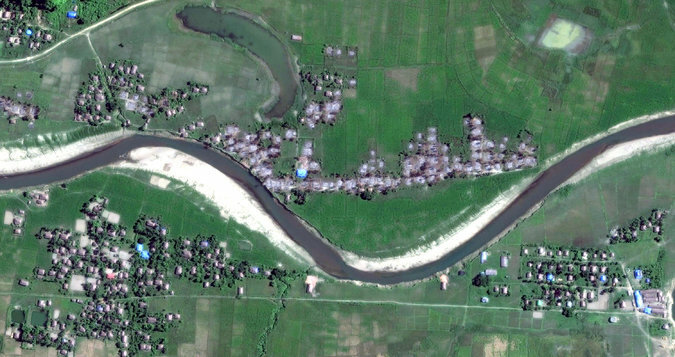 On Tuesday, Human Rights Watch published a 30-page report detailing a massacre in the village of Tula Toli, believed to be one of the worst-hit Rohingya hamlets. “Soldiers and Rakhine villagers burned the bodies in deep pits dug in the sand, in an apparent effort to destroy evidence of the killings,” the report asserts. Human Rights Watch also released satellite images showing that 40 Rohingya villages had been burned in October and November, meaning that at least 354 Rohingya communities have been affected by arson. Daw Aung San Suu Kyi, the leader of Myanmar’s civilian government, has said that the military ceased “clearance operations” against Rohingya insurgents in early September. Although Myanmar held general elections in 2015 that ushered in a civilian government led by Ms. Aung San Suu Kyi, the military that ruled for nearly five decades still controls most of the important levers of power. Critics of Ms. Aung San Suu Kyi, a Nobel Peace Prize laureate, say that while she has no authority over the armed forces, her public defense of the military has provided a moral shield for possible war criminals. During Ms. Aung San Suu Kyi’s tenure, Myanmar’s news media, which has only recently emerged from decades of censorship, has faced renewed challenges. High-profile journalists have been arrested on various charges. In October, two foreign journalists, a local reporter and their driver were arrested for illegally flying a drone in Naypyidaw, the country’s capital. Meanwhile, the families of Mr. Kyaw Soe Oo and Mr. Wa Lone say they have no idea where the reporters are being held.